Here is an elegant looking crochet ribbed ear warmer pattern that will keep you warm and cozy in the cold winter weather. It has a lovely stretch for a comfortable fit, and can be adjusted to any length that you need. The finished size measures 4″ across; for children this might be a bit too wide, so you could switch to a thinner yarn and smaller hook if want. The pretty texture is created simply with front and back post stitches. 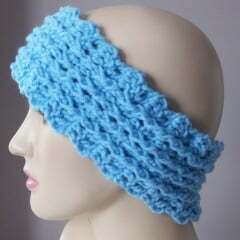 If you like the design, you might also enjoy the vertical ribbed ear warmer, or this pretty ribbed headband, which follows the same stitch pattern but is narrower. Material: Red Heart Comfort, or any worsted weight yarn desired. Finished size: Measures about 4″ wide. Repeat last 2 rows until you have reached a desired length. Fasten off and sew ends together.